The Chancellor set out how he will deliver economic security, national security and opportunity for families in Scotland. The Spending Review delivers the Government’s commitment to keep the Barnett Formula. The government is protecting and investing in the things that matter to working people; the security of strong defence budgets and a higher state pension to protect you in your retirement. The Scottish Government’s block grant will reach almost £30 billion by 2019-20. 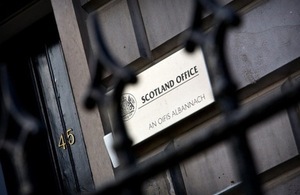 The Spending Review and Autumn Statement includes an increase in capital funding for the Scottish Government of £1.9 billion through the block grant, an increase of 14% in real terms over 5 years, in addition to the Scottish Government’s ability to borrow up to £2.2 billion for capital investment. The Scotland Bill will make the Scottish Parliament one of the most powerful devolved Parliaments in the world. It will have extensive new powers over tax and welfare. Lord Smith has fully endorsed the Scotland Bill, stating that it meets the principles set out in the cross-party Smith Agreement. The fiscal framework remains critical to the transfer of these responsibilities and constructive discussions are ongoing between the UK and Scottish Governments to ensure that Scotland genuinely sees the benefits and bears the costs of any decisions taken by the Scottish Government. More than £500 million will be invested in the Typhoon aircraft – including those based at RAF Lossiemouth - over the SR period through upgrades to its ground attack capability including a new Active Electronically Scanned Array radar. This will help to ensure Typhoon’s continued ability to contribute across the full spectrum of operations over the next two decades, allowing us to confirm that we will keep the aircraft in service until 2040. Procuring 9 Maritime Patrol Aircraft which will be based in Scotland. Since 2010 employment in Scotland has grown by 176,000 – including 83,000 more women in the workforce – with the number of businesses growing by more than 55,000. Scotland has the highest level of economic output per person in the UK outside London and the South East. The government is determined to support those in work by continuing to reduce taxes. In recognition of this, the government has committed to raise the personal allowance to £12,500 and the higher rate threshold to £50,000 by the end of this parliament. At the Summer Budget the government took the first steps towards meeting these commitments; increasing the personal allowance from £10,600 in 2015-16 to £11,000 in 2016-17, and raising the higher rate threshold from £42,385 in 2015-16 to £43,000 for 2016-17. By 2016-17, 2.5 million individuals in Scotland will gain by £84 and a total of 47,000 individuals will have been removed from income tax altogether, compared to this year (2015-16). Since 2010 a tax cut has been delivered for 2.4 million people in Scotland and taken 293,000 individuals out of income tax altogether. The first duty of the Government is to protect the people of Britain and that is what my Spending Review delivers. Protecting their economic security, by taking the difficult decisions to live within our means and bring our debts down. Protecting their national security, by ensuring those who keep us safe have the support and resources they need. And providing the opportunity for all we want to see. We have delivered our vow to implement the Smith Commission Agreement in full. The Scottish Government will now have to make the hard choices that we have had to in order to protect front-line services for the people of Scotland. The Spending Review also reflects the choices the UK government has made across the UK to invest for the future. I have confirmed significant increases to Scottish Government capital budgets of £1.9 billion. We are committing to new investments in defence and culture and the biggest rise in state pensions since 2001. This week demonstrates beyond any doubt how Scotland benefits from being part of a strong United Kingdom where we pool resources and share risks. When we spend billions of pounds to improve our defence and security, Scotland benefits from every penny that is spent. When billions more are invested in English hospitals then Scotland gets a fair share that can be spent on the NHS in Scotland. The UK Government is committed to growing our economy to create opportunities for all and to fund improvements in our security and our NHS. The Scottish Parliament is about to become one of the most powerful devolved parliaments in the world. This will mean more tax and welfare decisions will be made at Holyrood. It also means that Scotland still holds on to the benefits of being part of a strong UK.